cerith wyn evans’ final week at white cube central london; go, go, go! I finally made it back to see Cerith’s show at White Cube’s Mason’s Yard which is, I want to emphasise, just off Piccadilly in central London. The show closes on May 22 and I urge you to drop by to catch a stunning and substantial installation of recent works which makes the space live so well that it claims possession of it. My hopes were high for this show but I had to rush through an opening that was as busy as you might expect to be somewhere else. As a result I didn’t quite trust my impression that CWE had drawn all the currents in his work together into something quite so winningly complete. That is -at its most elemental- influence and intellect, taste and fancy all deliver something complex here that is coherent only as visual art. It’s clarified resonance would justify permanent -or DIA-style- installation in the site. “Everyone’s gone” is an exhibition in four parts; a neon installation called Subtitle which reads ‘Thoughts unsaid now forgotten…’ and echoes a very early work; EXIT. Secondly, a finely judged retake of Marcel Broodthaers blacking out of Mallarmé’s ‘Un coup de des jamais n’abolira le hasard’ [A throw of the dice will never abolish chance.] entitled F=R=E=S=H=W=I=D=O=W. All the elements in this latter are very CWE, of course, with some nice details. 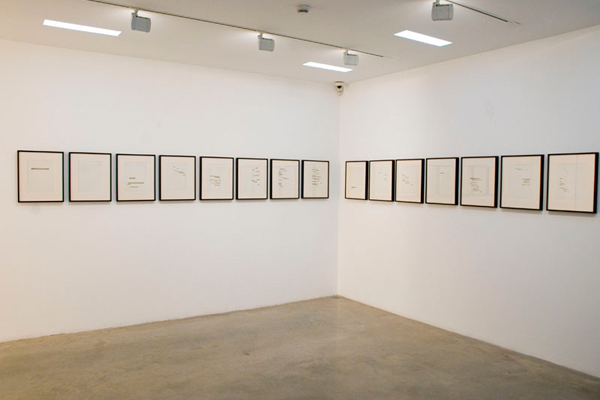 F=R=E=S=H=W=I=D=O=W is made up of 22 framed images displayed here in a single continuous line broken by a corner of the building, but with multitudes of possibility. Each side of each page of this famous Modernist work are displayed, here with all the words cut out by hand. So you look at variously sized rectangular boxes distributed elegantly across the page, the obverse visible on the rear of each page. The mount matches the colour of the paper, contrasting with the charcoal frames like ebony and ivory. After the title page the biggest slots -and most clearly visible on the back of alternating pages- are reserved for JAMAIS, N’ABOLIRA, LE HASARD; never abolish chance. This piece is beside the main gallery in the basement which has been taken over by the seven columns which make up S=U=P=E=R=S=T=R=U=C=T=U=R=E [‘Trace me back to some loud, shallow, chill, underlying motive’s overspill …’]. It’s a development on neon light installations in Antwerp and Japan, an installation that can and presumably will travel. Here, it’s an astonishing thing to behold and encounter because these architectural columns are made not only of light but also of heat. 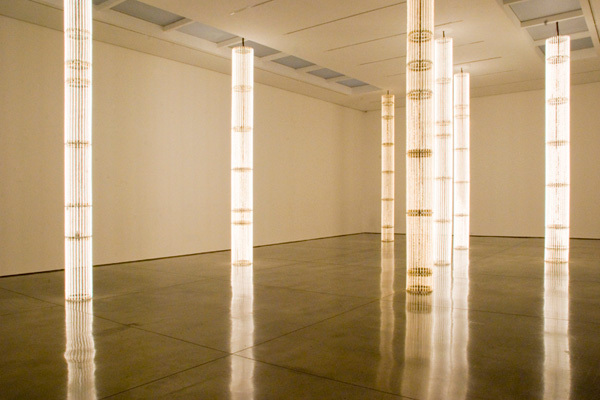 Each column reaches the full height of the gallery [some five metres] and is covered in transparent glass tubes containing filaments that glow and fade on an irregular cycle. The heat is overwhelming but when all the columns light up they conjure a tropical dawn, dusky horizonal skies, desert mirages as well as a celebration of human civility [and desire] in form. I’ve loved some of CWE’s firework pieces; the ones spelling out one of Gertrude Stein’s very characteristic titles; Before the Flowers of Friendship Faded, Friendship Faded, for example. This piece also links back to more recent White Cube shows of complex neon tracings –“Talvinder, you’ll never guess, it’s the Pacific Ocean again!”– and installed environments beyond. S=U=P=E=R=S=T=R=U=C=T=U=R=E draws together and transforms many of the elements of early work almost as a final statement. Its visual qualities reproduce quite well [minus crucial detail], but they’re only part of the work; you really do have to be there to experience it at all. This is why it belongs in a permanent collection, either like that reflective and smelly oil installation that has travelled with Saatchi or preferably at Tate Britain or Modern, the latter of which surely exists to offer sanctuary and celebration for works of this magnitude and achievement? Finally to the work that occupies the ground floor gallery, again, to unique effectiveness here. C=O=N=S=T=E=L=L=A=T=I=O=N [I call your image to mind] is described by the gallery as a ‘polyphonic sound mobile’ in which ‘sixteen mirrored discs gently rotate in mid-air, transmitting directional, ultra-sonic beams of sound.’ The sound is a diverse collage, including piano arrangements by CWE and field recordings from the Lovell radio telescope in Jodrell Bank [as distinct from an earlier similar-looking work with Throbbing Gristle and the soundwork with Florian Hecker]. It’s as difficult to describe as an installation of this calibre should be. 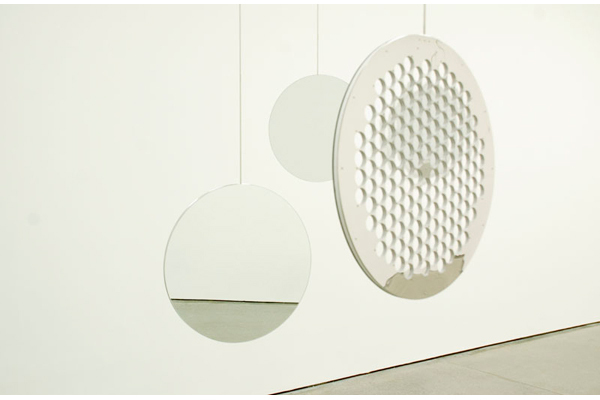 The discs are round and mirrored on one side, metallic speaker-like speakers on the other, suspended on a very simple metal-framed cable-clad mobile. In this gallery they don’t turn of their own accord as intended/advertised. To experience the work fully, you need to be in the gallery alone while the piece is still, when it becomes eerily full of electronic flight and muffled sounds in space replete with suggestive whispers. You walk through it and make the work come alive, with it’s symphony of sounds coming at you from varying angles, including some wall and object bounce, as you meet yourself at various turns. Then you need to experience it in flight -with all the discs moving, sounds shooting and ricocheting more effectively- when it becomes a performance; pure sound organised in space and so reminiscent of Edgard Varèse, which is quite an achievement. Beeps, squiggling, scratchy noises shoot behind you, out of a corner, meet mid room, and there is a busy aural bustle about the place that reminds me a bit of Glenn Gould’s radio pieces, nightclubs I’ve been spared and mostly of Varèse’s intent, but which is uniquely re-embodied here to properly magical [mysterious, mesmerising, delightful, alluring and one-off] effect. The show has been well if rarely reviewed, word of mouth has been positive, and it’s still on for a week. Yet this is an artist at their relatively/uncompromisingly/admirably ‘late’ peak, fully achieving something unignorable as well as indelible. It’s an intelligent art-making made simple by it’s completeness and astonishing presence. S=U=P=E=R=S=T=R=U=C=T=U=R=E glitters with more than mere gold [sweets; nudge nudge]; it captures something perfectly ephemeral with the permanence of a lepidopterist’s pin and provokes similar -here sweltering- ambivalence. C=O=N=S=T=E=L=L=A=T=I=O=N is a multidimensional and multi-form achievement, which competes with and complements the former and which is highly photogenic [irrelevantly] but actually quite close to the laboratory, mock-up or proposal [I hope permanently]. That is, these works appear highly machined but the filaments in one are constantly blowing out and being replaced, the mobiles provoked a number of questions in my mind about whether they were meant to look like they do and are surely improveable as objects -if machinery were all. But alone here with the artist, the final winning note is that inability and lack of desire to abolish chance in all its potency. Downstairs, it’s crucial that Mallarmé’s words have so obviously been cut out by hand only as neatly and regularly as possible. CWE’s White Cube page here. Visibleinvisible published 2008 by Hatje Cantaz here. Charles Darwent’s celebratory review in The Independent here. My love of Cerith Wyn Evans’s work knows no bounds. I have never been fortunate enough to be present at an exposition, but I have become a follower from afar! His multi-sensory creations have opened up my own reflections on M, my main literary squeeze, in entirely new ways.